Used Seat Alhambra Review - 2011-present | What Car? What's the used Seat Alhambra MPV like? 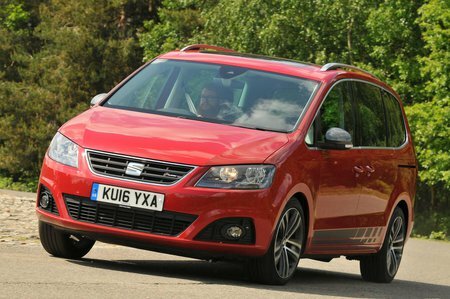 It’s fair to say the Seat Alhambra has been one of the Spanish firm’s big success stories, consistently selling well over a long career that can be traced all the way back to 1996. This is the second-generation version and, like the first, it shares a lot of its underpinnings with the near-identical but more expensive Volkswagen Sharan, likewise a large and capacious MPV that’s decent to drive and comes with room for seven, as well as a wonderfully practical interior and boot. Added to that, the Alhambra comes with sliding rear doors – this is a boon in tight parking spaces and a way of making it easier to get into the third row, as well as leaving a wide aperture to help with strapping small children into the middle row. It’s a large car, of course, but its dimensions are well balanced by a shape that is both clean and functional, and with plenty of the design flair you’d associate with Seat. Under the bonnet is a choice of petrol or diesel engines. The 1.4 TSI 150 petrol has been the mainstay of the range and it's supplemented by the 2.0 TDI 150 diesel, which also comes as a more powerful 184 version. All engines come as standard with a six-speed manual gearbox, with the option of a seven-speed dual-clutch automatic transmission. On the equipment front, there were originally five trim levels to choose from: S, SE, Connect, SE Lux and FR Line. Entry-level Alhambras come with 16in alloy wheels, heated door mirrors, sliding rear doors and parking sensors, while inside there is three-zone climate control, electric windows all round and a 6.5in touchscreen infotainment system complete with Bluetooth streaming. Upgrading to SE got you a few more luxuries, including 17in alloy wheels, tinted rear windows, front foglights, cruise control and automatic wipers and lights, while Connect models gained features such as sill plates, blue cloth upholstery, run-flat tyres and smartphone integration. SE Lux trim adorns the seven-seater with electrically opening rear doors and tailgate, a panoramic sunroof, leather upholstery, heated front sports seats, sports suspension, sat-nav, a DAB radio and a reversing camera. FR Line gains sporty details including bigger alloy wheels, an aggressive bodykit, FR decals and Alcantara upholstery. On later models, the top-spec trims were replaced by Style Advanced and Xcellence. On the road, the Alhambra belies its size. Even the 1.4 petrol's performance is more than sufficient and is the smoothest and most refined option. The 2.0 TDI 150 has more low-down grunt and is reasonably refined, while the 2.0 TDI 184 is positively swift, easily able to haul around a fully loaded Alhambra. Make no mistake, the Alhambra is an MPV, and a large one at that. But within that class, it’s one of the best to drive. The steering is eager, there’s plenty of grip and the handling is safe, secure and, if not downright fun, at least much better than you’d expect. As far as ride quality goes, there’s an impressive blend of bump absorption and body control. It can suffer some jarring over bigger bumps, but it never threatens to become uncomfortable. But it’s interior space where the Alhambra shines. There’s loads of space up front, with a clear and logically laid out dashboard. The driving position is excellent and visibility good. There’s even more space in the rear, with plenty of room for three adults abreast in the second row, and even enough room for two adults in the rearmost row. In addition, the boot is huge with the rearmost seats folded down, and still sizeable with all seven seats up. Practicality is great, with plenty of cubby holes and foldable picnic tables. All three seats in the middle row can be slid backwards and forward individually. The Alhambra scored the full five stars in its Euro NCAP crash tests and was awarded strong marks by Thatcham Research for its resistance to break-ins and being driven away. 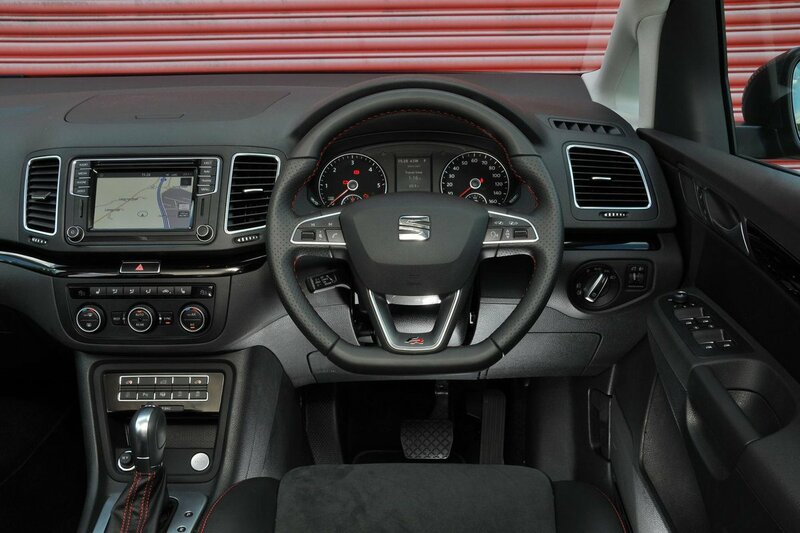 Seat includes tyre pressure monitoring, seven airbags, an alarm and engine immboliser with every car, while lane assist, road sign recognition and blindspot monitoring were available as options when the car was new.